I’ve reared more than my share of arthropods over the years—from easy ones like Madagascan hissing cockroaches to hard ones like certain tiger beetles (in fact, I’m the only person to have ever seen the larva of Cylindera celeripes, much less reared them from egg to adult) to the innumerable tarantulas, scorpions, millipedes, hickory horned devils, darkling beetles, etc. that fall somewhere in between. And that’s just as a hobby entomologist—nevermind that it has often been my job over the years to rear dozens of species of insects and other “critters” as part of my professional duties. One group of arthropods, however, that I have not yet tried to rear are tailless whip scorpions or whip spiders. Members of the arachnid order Amblypygi, they are not scorpions, not whip scorpions, not even spiders, but rather something else. Like other arachnids they have eight legs and the combined head and thorax (cephalothorax); however, more than any other arachnid, tailless whip scorpions have stumbled upon a most insect-like body plan—the first pair of true legs are modified to long, thin, sensory appendages that mimic in form and function insect antennae, leaving—again, like insects—only three pairs of walking legs, and as predators they have the anteriormost pair of appendages (pedipalps) modified into grasping, jaw-like structures analogous to the toothy mandibles of predaceous insects. 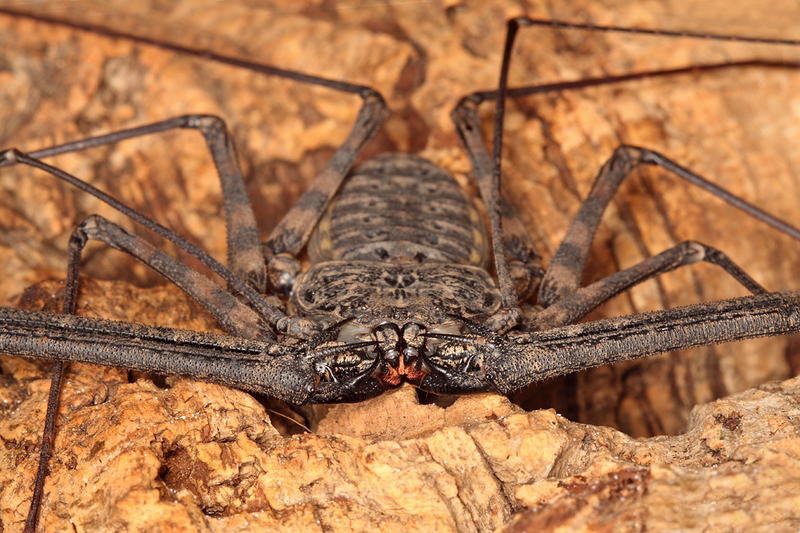 Of course, any resemblance to insects ends right there—tailless whip scorpions look like they belong not only to another class, but another world! Flattened, scuttling sideways at blinding speeds, and with legs all asplay at odd angles, they are as frightful and menacing in appearance as the hairiest, jaws-dripping-with-venom spider imaginable. However, nothing could be further from the truth. 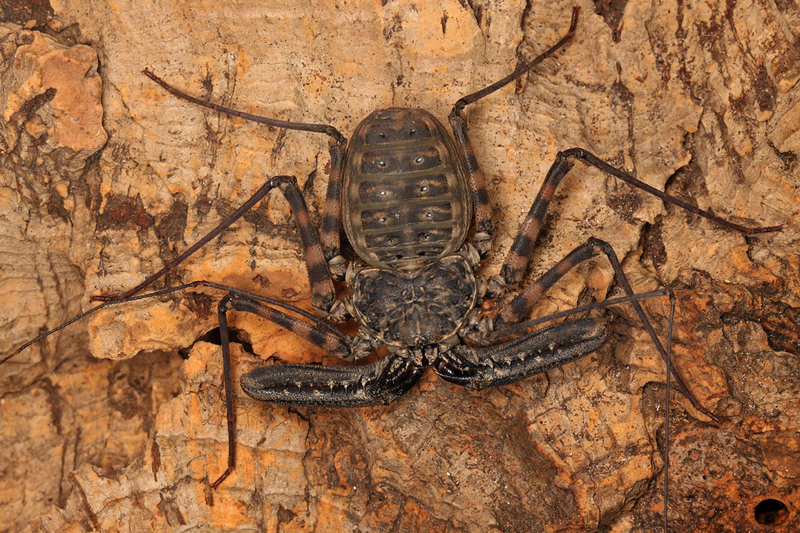 Lacking the sting of a scorpion, the venom of a spider, the powerful bite of other “jawed” creatures, or even defensive chemicals of any kind, tailless whip scorpions have only their speed and ability to hide in the slimmest of crevices to prevent them from becoming easy meals for the vertebrate predators with which they share their world. …while in females the pedipalps are distinctly shorter. The male and female Damon diadema, or Tanzanian giant tailless whip scorpion, featured in these photos belong to Martin Hauser, a dipterist with the California Department of Food and Agriculture in Sacramento who I had the pleasure to spend some time with last month. Like me, Martin is a fan of invertebrates as pets, but unlike me he has strayed into unusual taxa that I haven’t yet tried—these tailless whip scorpions being perhaps the most impressive of these odd groups. Hailing from east Africa (eastern Tanzania and Kenya north to Ethiopia and Somalia), this species has gained some popularity in recent years among hobbyists due to their adaptability to culture, relatively docile nature, and—of course—their terrifyingly impressive size (body length up to 30 mm according to Prendini et al. 2005, although some hobbyist forums state as much as 2 inches, and with “whip” spans many times that). In this species males and females are immediately distinguishable by the relative length of the pedipalps—highly elongate in males and with the “elbow” extending past the “knee” of the first pair of walking legs, while shorter in females and not reaching the knee. Damon diadema is the largest of the East African Damon variegatus species-group, and while there are other amblypygids in the world that are larger (e.g., Acanthophrynus from Central and South America, with up to 10″ leg-span and nearly 20″ whip-span), none are so tolerant of captive rearing as this species. There seems to be some confusion about identification of Damon spp. among hobbyists, and even Martin wasn’t sure which species his represented; however, according to Prendini et al. (2005) all of the species are easily distinguished morphologically. Damon diadema is one of only two species in the genus with two spines rather than one on the ventral surface of the pedipalp trochanter, the other being D. brachialis from southern African and unknown in captivity. In the closeup face shot of the adult male below, two spines can be seen on the right pedipalp trochanter, just visible between two of the pedipalp apical spines. Pedipalps modified as raptorial ”claws” make these arachnids formidable predators. I visited Martin at a good time, for not only did he have these marvelous monsters available for me to photograph, but one of the females had just recently produced a brood of young. All of them had reached 2nd instar by the time of my visit, with one or two already at 3rd instar. It was interesting to note the tendency of the juveniles to aggregate under the adult female, as if they needed/wanted her for protection. While seemingly obvious, this is actually quite interesting because most amblypygids are considered to be solitary and intolerant of conspecifics (Walsh & Rayor 2008). Damon diadema, however, is known to live in prolonged subsocial groups, apparently aided by kin discrimination abilities. I find this fascinating, considering the extraordinarily limited neural capacity of these creatures—there are only so many brain cells available for conducting the business of life without diverting any of them to the ability to recognize unrelated conspecifics, much less their own kin. It is the reason so many spiders and other predaceous invertebrates tend to live solitary lives and have evolved elaborate courtship dances to convince a potential partner that they are, in fact, a mate and not a meal. Two ventral spines on the pedipalp trochanter distinguish Damon diadema in east Africa. I was so impressed by these creatures that after returning home from California I set about finding a source from which I could purchase one of them—or better yet a male/female pair. Sadly, I could not find any sources—my dream of seeing these fantastically fearsome-looking fellows in an aquarium in my office would have to wait. I happened to mention this in passing during correspondence with Martin about other matters, and although it was not intended as a suggestion (or even anticipated that it could be interpreted as such), Martin immediately offered to send me a couple of his juveniles. How could I refuse?! We corresponded a little more about preparations for and timing of the shipment, and on Friday last week the package arrived. Neither of us were completely sure how well the little guys would handle a 3-day transcontinental journey, so it was with a blend of anticipation and trepidation that I opened the package. Imagine my surprise when I found them not only alive and well, but all six of them were alive and well! Well, for now they are all going under the name “Baby Damon,” but I suppose as they grow and (hopefully) develop some distinctiveness I can start giving each of them their own, unique name. It may take awhile—individuals of this species don’t mature sexually until around 12-15 months. Martin was also kind enough to include some small, temporary containers that will provide better confines until they are large enough to move into the large terrarium that I readied for them, and just as Dave has been doing with his tarantulas, it will be fun to monitor the progress of each individual through their molts. This will continue to provide entertainment even after they reach adulthood, as amblypygids continue to molt and increase in size all of their life. Their lives could also be long ones—I’ve read of people maintaining this species for 10 years or more as adults, so it looks like I am in this for the long haul. A formidable challenge it might seem, but in addition to the invertebrates I mentioned above, I’ve also spent the past several decades being responsible for cats, dogs, rats, salamanders, and—most recently—two hominine juveniles (and females at that). Now that’s a challenge! This 2nd instar youngster can already handle crickets its own size. Prendini, L., P. Weygoldt & W. C. Wheeler. 2005. 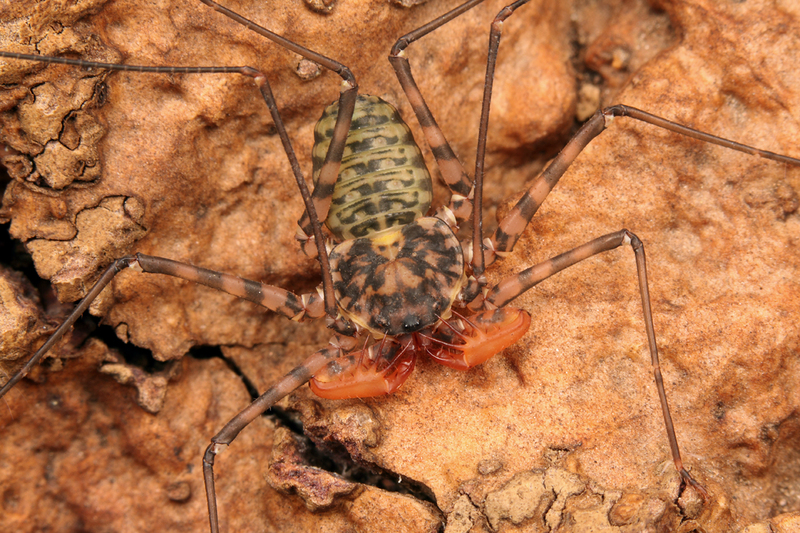 Systematics of the Damon variegatus group of African whip spiders (Chelicerata: Amblypygi): Evidence from behaviour, morphology and DNA. Organisms, Diversity & Evolution 5:203–236. Walsh, R. E. & L. S. Rayor. 2008. Kin discrimination in the amblypygid, Damon diadema. The Journal of Arachnology 36:336–343. 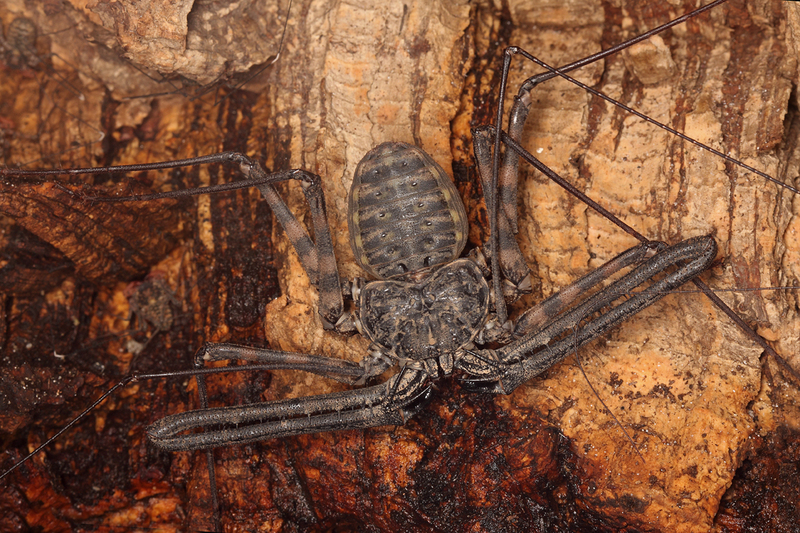 This entry was posted in Amblipygi, Arachnida and tagged arachnids, captive rearing, nature, science, tailless whip scorpions, Tanzania, taxonomy. Bookmark the permalink. I don’t think any other arthropod has a higher dangerous-looking to not-dangerous ratio than these guys! This is a great concept for a ratio! That said, what is at the other end of the scale?! Blue Ring Octopus. Cute and deadly. I’m always speechless! I’ve never seen this kind of animal…amazing! Oh yes! you’re crazy about your work … and it shows … I love it! Cool critter! I wish Alberta would relax its laws somewhat to allow these kind of exotic (and captive bred) creatures in. Well, we wouldn’t want these guys running loose through the Canadian tundra now, would we?! Yeah, they might end up being harmless to someone, then dying in the winter. But but but…if they were inadvertently irradiated by some random nuclear device, they could morph into fierce beasts !!! and nibble your bum ! Great photos as usual – love the fierce teeth shots !! You know What a sucker I am for face shots! You could always emulate Alex and do a face shot with those fierce teeth attached to your elbow or hand ! Very nice, Ted. 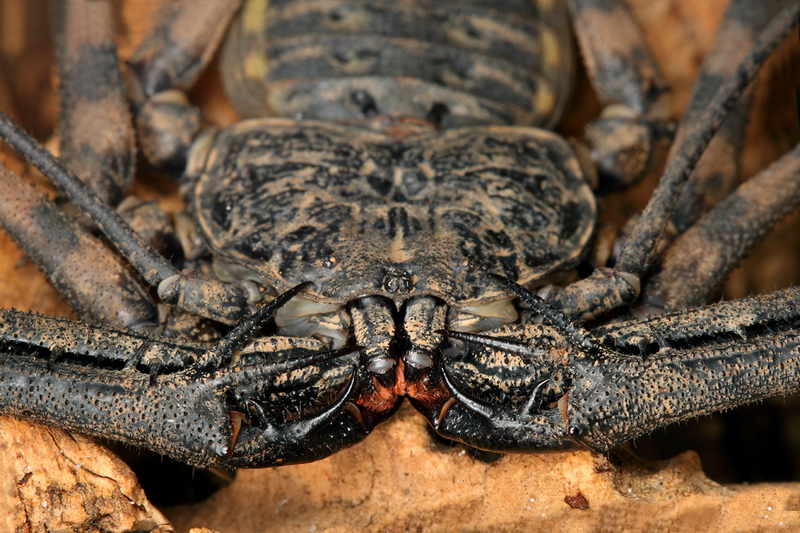 I’m enjoying vicarious, digital Tanzanian giant tailless whip scorpion ownership. I’d love to see a molt sequence if you can catch one. Oh, and Happy Father’s Day! As parent of a hominine young adult male, I’m enjoying following your ownership of the two hominine female juveniles! I understand they grow slowly, so we’ll see what we can do for photos. I hope your hominine male progeny treated you well today! 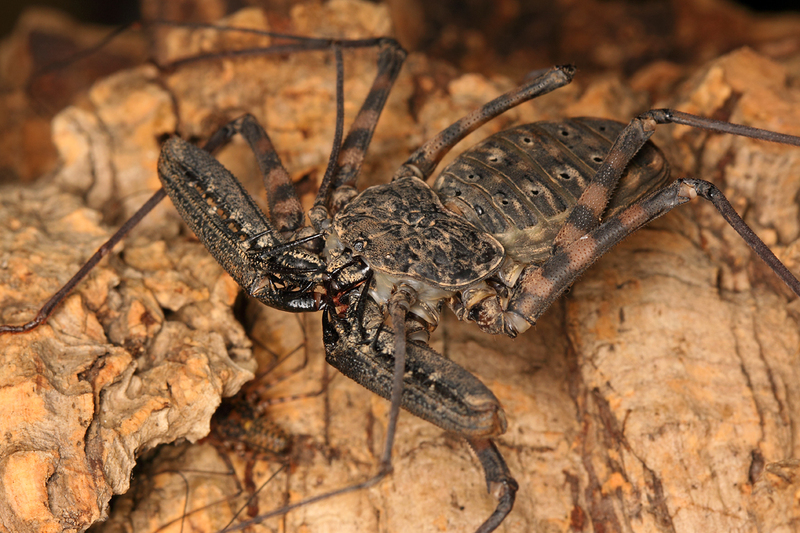 There are about 150 species of tailless whip scorpions throughout the world. This particular species lives only in Africa, and though it may look the same as those that live in Costa Rica it is not the same species. There really are more environmentally considerate ways to deal with unwelcome guests in our homes. Even if it were a deadly poisonous spider, a broom would not only be quite effective but would also avoid the very real danger of accidentally exposing your daughter with toxic pesticide.